After a career-ending crash in 1967 that cost him his arm, Factory Harley-Davidson team racer Chris Draayer called on his teammate, the legendary Mert Lawwill, to build him an adequate prosthetic hand for riding his motorcycle. Lawwill built a single prototype prosthetic as a favor for his friend Draayer that carried him through eight years of riding and racing without incident. More recently, articles featuring Chris Draayer and his “one and only of it’s kind” handlebar attachment had fellow one-armed cyclists calling on Lawwill to head back to the machine shop. Mert fine-tuned his original design and prepared for quantity production with the collaboration of DKG machine shop owner Dave Garoutte. Well known for fabricating products for the bicycle and motorcycle industries, DKG has been in the business since 1978. 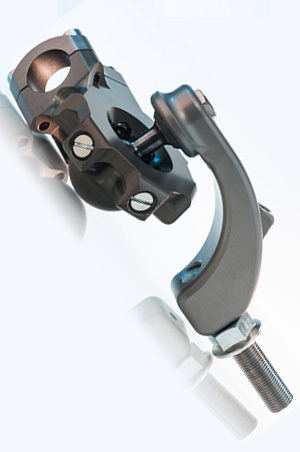 The result is the updated Mert Lawwill Quick Release Handlebar Attachment for both above and below elbow amputees. During the initial development, Draayer had tested many prosthetics and determined that a physical attachment to the bike provided the greatest stability. Draayer also realized (after many road rashes) the need for a release mechanism. Thus was the concept for Mert Lawwills’ original Quick Release Handlebar Attachment featuring a ball and socket design. The actual hand piece is a ball, which snaps into a socket attached to the handlebars. The ball releases from the socket when a “ramp” on the hand piece puts pressure on the surface of the socket and mechanically forces itself out. Six individually adjustable detents within the socket allow the rider to determine how much release pressure will be required to detach from the handlebars and at which points. Ever conscious of durability and excess weight, the updated hand piece and handlebar attachment are CNC machined from hard-anodized aluminum and feature a hollow, heat-treated, stainless steel ball. Weight is additionally reduced through extensive detailed machining. Range of motion is improved by DKG’s CAD developments and is now adjustable. These substantial refinements have greatly improved on the original design, which had flawlessly withstood Chris Draayers’ continual and rigorous testing in such races as the Sun Valley Grand Prix and the BMW Battle of the Legends, Daytona Speedway. Designed by racers, with racers, and for racers. Special thanks to the DKG machine shop found at www.dkg-cnc.com.